George Nelson was an illustrious American designer, born in 1908 in Connecticut. After studying at Yale, he began his career with the Herman Miller company, working alongside other famous designers such as Charles Eames and Isamu Noguchi. He frequently met other artists such as Mies van der Rohe and Le Corbusier. Nelson is the orginator of the unmistakable Coconut Chair. 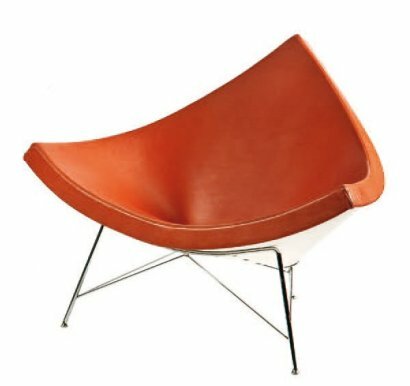 The Coconut Chair was designed in 1955 by George Nelson. After numerous attempts, he refined his style into a trademark that mixed purism, rationalism and modernism. These elements combined marvellously despite their initial conflict. It is an example of a singular design. Named due to the body being shaped like a quarter of a coconut, sitting in it is like plunging into a small cocoon. With a solid steel base and triangular feet in polyeurethane and aluminium, it is strong and safe. A leather cover makes the cushion perfectly comfortable. No chair that has circulated since can match the Coconut's relaxing and fashionable style, whether in a bar or a home, much to the designers' delight. The Coconut Chair is a timeless creation that has been a phenomenal success.